All students should have an equal opportunity at extra credit. For a student with a borderline grade, nothing is more exciting than hearing their teacher say “extra credit.” Although extra credit can benefit students whose efforts are not reflected in their test scores, not all versions are fair to students. If students are willing to complete extra assignments or worksheets to receive extra credit, then they should be allowed to receive extra points. 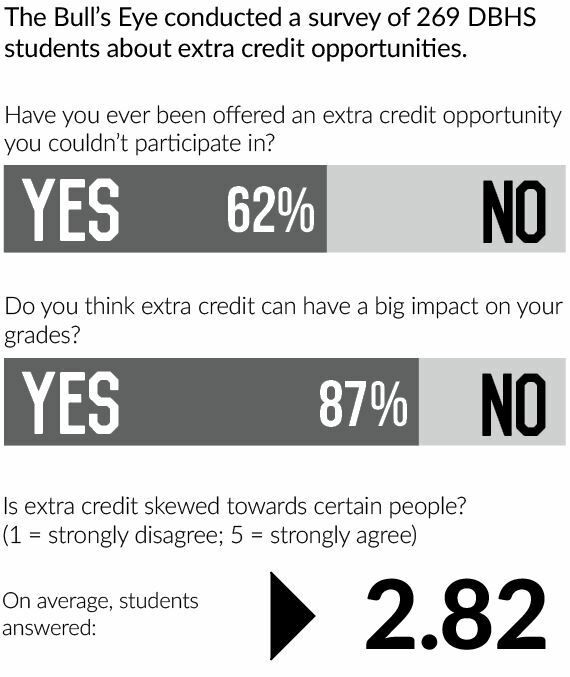 As long as all students are given an equal opportunity to earn extra credit, there is nothing wrong with offering it. If offering bonus points works as a motivation for a student to strengthen their understanding of a subject, then it is a win-win situation for both the student and teacher. While extra credit may allow for laziness and gives students an excuse not to study for tests, allowing these students to do worksheets or projects to make up points gives them a chance to still get good grades without being killed by their test scores. Certain people are simply not good test takers, and their poor test performances are not necessarily a reflection of their mastery of the material. However, extra credit is not always justified. Giving students extra credit for winning classroom games or Kahoots creates a system where often the only students receiving extra credit are the ones who are already doing well in the class and do not need the points. While you could argue that this system is fair and students who win the extra credit are the most deserving, the point of extra credit should be to give struggling students a chance to improve their grades. Such activities do not fulfill this purpose and are unnecessary. Giving extra credit to students for completing activities that cost money should also be eliminated. Students should never feel like they are able to buy a grade in a class. Though it is commendable to want students to support campus performing art groups or raise money for important causes, some students simply cannot afford to, whether it be money or time-wise, fulfill this type of extra credit. Though extra credit projects can be beneficial if they align with course curriculum, some projects are offered that require a minimal and mindless effort. Such extra credit is anti-educational, causing students to complete busy work to cushion grades instead of learning from a class for the sake of learning. If a teacher plans on offering an extra credit assignment, they should make sure that the material of the assignment will help their students improve their performance, not just their grades, in the class. Bathroom passes are another example of an unfair extra credit opportunity. While teachers have the right to make sure that their students aren’t leaving class for no reason, giving some students more points than others due to medical issues out of their control doesn’t seem fair to those with overactive bladders. Not all extra credit is created equal, and teachers should reevaluate the forms that they are offering to ensure fair opportunities for all students.